I loved Amanda Jennings last novel, In Her Wake, which I included in my top reads list for 2016. (You can read my review of that here.) The Cliff House is every bit as addictive and intriguing. The Cliff House is a dark tale of obsessive love but unusually, the object of desire isn’t a person but a thing: the house itself. It has always been a very significant place for Tamsyn who used to go there with her father when she was younger. He always said that one day they would live there. There are touching scenes between Tamsyn and her father as she recalls time spent birdwatching with him. After his tragic death, Tamsyn watches the owners, the Davenports, and thinks their life is perfection. It would be a dream for her to live there, but it’s a prison, a nightmare even for Edie, the daughter of the family. Tamsyn is dazzled by the family who live in the Cliff House, so very different from her own. Edie befriends Tamsyn but it seems it’s for her own good, she’s using her. She seemed very much the archetypal ‘poor little rich girl’. She was a fascinating and complex character. Although I didn’t like her much, she was very intriguing. She was manipulative, spoilt and selfish yet at times her vulnerability showed. Behind the glamour and opulent lifestyle, all was not as perfect as it seemed. Edie was an unhappy girl, just wanting to be loved. Her mother Eleanor had drink problems. Her writer father Max was often seen at events with younger more glamorous women on his arm. Theirs was clearly not a happy marriage. In the same way the house seems to be a brooding presence over the cliffs, there is a sense of foreboding throughout the book. You can sense everything is going to go wrong but how and why? This feeling is reinforced by sections of the book in the present day – someone is haunted by the past but which of the girls is it? Cornwall comes alive in The Cliff House. Amanda Jennings’ beautiful writing is sheer poetry describing the coves, the cliffs, the ever changing sea, the weather. 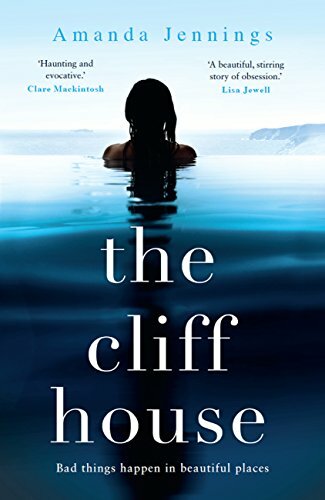 The Cliff House is a tense read with that tension building steadily throughout to the shocking events in the final few chapters. An enthralling tale of obsession, loss and toxic friendships. I did enjoy this with the house almost seeming like a character in its own right. Great review Joanne! Great review. I’m really excited to get my copy of this tomorrow – a Little birthday present from me to me! Hope you love it too and happy birthday! Wonderful review of what sounds like a great novel. I really enjoyed “In her wake” and would love to get my hands on a copy of “The cliff house”. It is on my ‘wish list’. Thank you. Hope you enjoy it too when you get a copy.